Barry, Barry… Well, the commissioner of baseball, Bud Selig, has rejected Barry Bonds’ contract drafted by the San Francisco Giants. Originally, the contract signed by Bonds contained a provision giving the club the right to void the deal if he is indicted; however, his agent, Jeff Borris, says the language is unenforceable under baseball's collective bargaining agreement. An issue with the contract also deals with the amount of appearances he’s required to make. In the end, the contract will probably be done, whether it has to go to an arbitrator or it will be hammered out between the Giants and Bonds’ party. The Giants and Bonds need one another and when it is all said done, expect him to be a uniform. 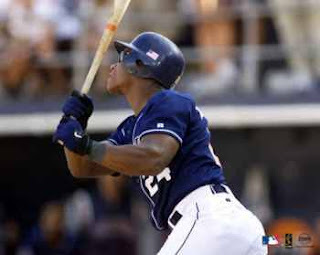 Steroids and Baseball: The United States Congress could once again intervene in the business of baseball if MLB does not cooperate with the Mitchell Investigation. Basically, Congress wants all active players and owners to cooperate fully with the probe, or they will get involved. Personally, the only way baseball will ever get rid of the perception of the sport being tainted is to just adopt Olympic style drug testing advocated by the WADA, World Anti-Doping Agency. More on Bernie: CNNsi.com reports that the Yankees have invited Bernie Williams to c amp, but not offered a contract to him at all. It looks like the Yankees are ready to sever ties with a player integral to their team the last 2 decades, and considering he hit .281 with 12 homers as well as still productive something is not right about this. Even though he could play with another team, he clearly wants to be a Yankee. Bernie seems to very hurt and a victim a bruised ego, but I wish him the best. 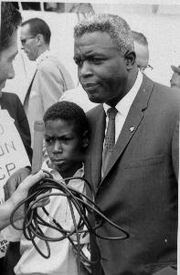 Today is Jackie Robinson’s birthday, and he’d be 88 if he were alive. He helped not only sports integrate with his courage and willingness to play in such a turbulent time, but in all society as well. The world was not made perfect, but better with Jackie in the game of baseball. He was a part of 6 World Series teams, and won the Rookie of the Year, and an MVP Award. However, it’s his greater impact that matters. Even though he wanted to fight at the ugliness on the field and around him, he didn’t knowing that he’d hold back progress. In the end, if it was not for Jackie Robinson, we may not have not seen Satchel Paige, Larry Doby, Frank Robinson, Hank Aaron or the other African-American players suit up and play ball for a while after 1947, if not even longer. He was a fine athlete, but even a finer human being and it’s a shame he had gone so early. According to the Associated Press, Orioles legend and Future of Hall of Famer, Cal Ripken is expected to bid on the Double AA Harrisburg Senators. He submitted a bid before the Tuesday 3pm deadline. As the city is struggling, they want to sell the team to balance their budget. "Let's call it like it is," Ripken Baseball spokesman John Maroon said. "Our owner sets us apart. Cal Ripken has earned a lot of respect from fans and businesses. And the fact that he knows what he's doing, as he's demonstrated in two places so far, really serves us well." As well know, Cal owns the Ironbirds with among several other minor league teams. He has spent much of his post-baseball career cultivating the game with kids and working on various business ventures. 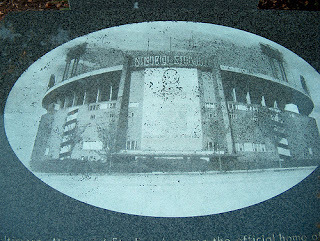 Mike Boehm of MVN’s Oriole Magic writes a wonderful article about Memorial Stadium. He opines on Memorial Stadium today and his thoughts of the place while he was growing up. Good job, Mike! Anyhow, my memories of the place are quite faint. I’m only 28, so I don’t have the recollection of the place that other people do, but it was basic stadium, perfect for it’s time. 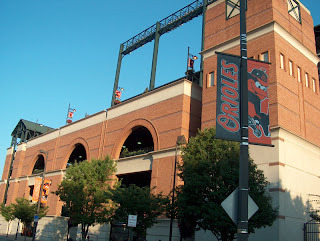 I had only been there perhaps 4 or 5 times as a kid before Camden Yards opened, as I grew up near Washington D.C., and my parents who were not the biggest baseball fans in the world only drove up there when I forced them to or pleaded to go. I also went to a few games with my friend back then David and his dad, who loved baseball and really got me into the beauty of the sport and got me playing it. I think I went to the stadium once for like a safety patrol day or something like that in elementary school. I just remember thinking it was like the Roman Coliseum (remember, as a kid anywhere huge is grand) and the field was perfect. The scoreboard had the cute little swinging board, and there was the smell of smoke everywhere. I never sat up close, and sat in the cheap seats (I think one time I sat behind a pole). Looking back, Memorial Stadium served it purpose for the years it was up. In the age of luxury boxes, state of the art sound and newness, Memorial Stadium is more or less, substandard. However, for many Baltimore citizens and those who lived through the 50’s to 90’s, the stadium served as a house of magic, where you saw Frank, Brooks, Cal, Eddie, Johnny, Art and many others become icons and cement their legend in Charm City. Because of my lack of exposure to Memorial Stadium and I not really growing up in Baltimore or the suburbs of the city, I cannot write as well or in a romantic sense that Mike was able to express, but nearing 30 and hoping for kids & family one day, I can now fully understand the bond that people had with the stadium, the Orioles the Colts. On the South Side of Chicago, fans were euphoric after winning the World Series in 2005, and fans were looking forward to the boys in black to have a back to back championship season. White Sox GM, Ken Williams worked in earnest to improve the team from what it was in 2005 into 2006 with more wheeling and dealing. In the end, their mission was not successful and the White Sox finished third with 90 wins in a stacked division featuring the Minnesota Twins and Detroit Tigers. The White Sox were strong throughout the season, but a bad August & September all but doomed the team. 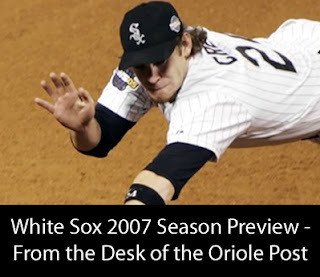 In light of not heading to the postseason in 2006, the White Sox seem ready to make a run at the AL Central once again in 2007. Under the watchful of charismatic, yet controversial manger, Ozzie Guillen, much of the core of the team returns as well as several new additions, such as former Angel Darrin Erstad, Andrew Sisco from the Royals, along with Gavin Floyd, Toby Hall, & David Aardsma. The team jettisoned several players such as Freddy Garcia, Neal Cotts & a few others via trades. As well, the team traded Brandon McCarthy to Texas for 3 players who will probably be in the minors for now. The powerful offense of 2006 should return this upcoming season, as they led in most statistical categories and once again put the fear in opposing pitchers. As with every team, the key to a good season lies with starting pitching and the White Sox have a great staff, but it went through some changes as well in the winter. The rotation seems pretty much set with Jon Garland, Jose Contreras, Javier Vazquez, Mark Buerhle and possibly Gavin Floyd in the fifth spot being that Freddy Garcia got traded to Philadelphia. The White Sox starting pitching which was so dominant and efficient in ’05 went to through quite a bit of struggle. Garland won 18 games in ’06, although he had an ERA and the mid 4 range and will have to improve on giving up runs; however, it may not be much of a concern providing the offense the team has. Mark Buerhle and Javier Vazquez finished with records below .500 and will need to regain their ’05 form for the team do well. Considering their track records, especially Buerhle, you should expect some improvement amongst the staff. 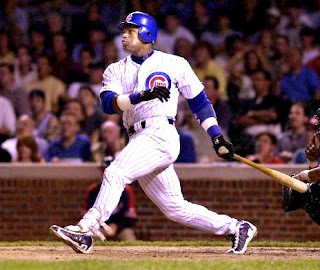 Jose Contreras went 13-9, but had an injurt after a great 2005. He’s one of the guys who should be better as well. The wild card in the starting rotation is Gavin Floyd. A young pitcher with a lot of upside, he went 4-3 with an ERA above 7 in 2006. He will have to get it all together in the Windy City in which the crowd can rival anything he faced in Philadelphia. The White Sox will need him to maintain stability within the rotation and contend in the ever-tough AL Central. Now, let’s move onto the bullpen. Closer Bobby Jenks also had a down season from 2005, as his ERA was at 4. However, he did save 41 games and showed at times flashes of brilliance which made his 2005 so great. Hopefully, he can bounce back and help the team in the bullpen. New members to the White Sox, David Aardsma & Andrew Sisco will share in the setup role for Bobby Jenks. Also in the bullpen will be Matt Thornton, Mike MacDougal, Nick Massett and possibly Gavin Floyd if he’s not a starter. In terms of the everyday starting lineup, the offense should look just as formidable as it did last year, with key members Jermaine Dye, Jim Thome, Paul Konerko, Joe Crede and AJ Pierzynski in the fold. Jim Thome will be the DH, as he hopes to maintain his level of play and focus behind the plate en route to a possible spot in Cooperstown. After his struggles in Philadelphia which saw him traded from the team in favor of Ryan Howard in 2006, he picked himself up from his struggles and batted .288 with 42 home runs and 109 RBIs. He should be able to keep his numbers as he will be 37 in August, but could the period of decline. With exception of 2005, his track record shows he should be a nightmare to opposing pitchers in 2007. The infield for the White Sox features two of the best corner infielders in the game, Paul Konerko and Joe Crede who played a huge role in the White Sox winning 90 games. Paul Konerko carried a big stick as he hit 35 home runs with 113 RBIs and considering the past few years, he should be counted on keeping up his production. Joe Crede has a career year, as he hit 30 home runs and drove in 94 runs, as well as played great defense. Crede has always been a player to watch, and in 2006 he cemented himself as one of the premier third baseman in the game. Only 28, he should be expected improve and he can be a cornerstone of the franchise for years to come. The rest of the infield is in flux because of the situation with shortstop Juan Uribe. He’s currently in legal trouble in his home country of the Dominican Republic due to a shooting he’s alleged to be involved in. Even with his current situation, he struggled in 2006 to a .235 batting average and lack of discipline at the plate. Hopefully his situation can be resolved, but even if it is, he’ll still need to devote himself to improving his offensive numbers. Tadahito Iguchi will be the second baseman and provided the team with solid numbers along with incredible defense in ’06. He’s been nothing but reliable, and the White Sox hope he continues his solid play. The bench for the White Sox infield will be covered by Alex Cintron who hit .285 and provided some solid infield support, along with Josh Fields who may play a huge role in the team’s future along with Andy Gonzalez and Pablo Ozuna. The outfield for the White Sox will be manned by Jermaine Dye, in right field, Brian Anderson in center fielder, Scott Podsednik in left and Darrin Erstad should see a good amount of playing time. The team hopes that Jermaine Dye can follow up on his MVP caliber season where he slammed 44 home runs, drove in 120 runs and hir for a .315 batting average. Obviously, he should a key cog in a very potent offense. Although he’s had some injuries in the past, the White Sox hope he remains healthy from here on out. However, the rest of the outfield is shaky in terms of its offensive output. Scott Podsednik, one of the core players on the 2005 Championship team had a 2006 full of struggles. He started off real bad in ’06 and all his numbers dipped across the board with exceptions of RBIs and runs scored. As the leadoff hitter for a team with an offense so potent, he needs to do much better in ’07. The other player who struggled even greater was Brian Anderson, a rookie in 2006 who only .225, but provided a great glove. Anderson will be heading into year two in the majors, so hopefully he can improve from his rookie season. He’ll be the wild card in the outfield, and if the Sox want to improve offensively, both Anderson and Podsednik improving would go a long way. Former Angel Darin Erstad joins the fold, after a productive career in Anaheim before injuries took its toll. He’s also can play infield, as he was a first baseman for the Angels, but for now will man Podsednik’s position while he recovers from offseason surgery. On the bench for the outfield will be Rob Mackowiak. The catcher’s position is covered by the controversial A.J. Pierzynski. He had a very solid season where he batted .295 with some power and drove in 64 runs. Always reliable behind the plate, his numbers were good across the board, however, with the struggles of the pitching staff last year, he’ll needed to help the pitching get back to it’s 2005 level. Backing up A.J. will be veteran Toby Hall. In the end, repeating as a champion in any sport is hard, and the White Sox know that all too well. Even though the team came back better on paper in 2006, things do not go as planned. In Chicago, 2007 should be another interesting with the White Sox looking to take supremacy of the loaded American League Central. Time will only tell if Ken Williams moves in the winter help the White Sox earn another trophy. Fanfest is on for April 1st at Camden Yards. I am in the middle of doing some stuff with some friends, but Baltimore Sun blogger Roch Kubatko has details on it, and the announcement is up on the Baltimore Orioles website. Well, if you have been under a rock, just to update you all, Sosa and the Rangers finalized a minor league contract Tuesday. If added to the major league roster, he would get a $500,000, one-year deal with the chance to earn $2.1 million more in performance bonuses. Also not to go into ancient history, but Sammy Sosa struggled mightly in Baltimore as he only hit 221 with 14 homers and 45 RBIs and was sent on his way after being on the disabled list and a team cancer. It’s unknown whether he did steroids or used performance enhancing drugs, but 2007 will be crucial test to see if he still has some skills to play baseball or not. 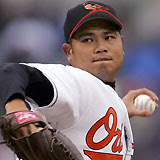 Another old friend, Bruce, the Comedian: According to CNNsi.com, the Rangers are interested in signing LHP Bruce Chen to a minor league deal. Chen, who pitched well in Puerto Rico this winter, is weighing similar offers. As well, the Twins were rumored in signing him as well. "Free-agent pitcher Sidney Ponson pulled out of TwinsFest one day before it started because he needed to take care of some unexpected business. That left Twins General Manager Terry Ryan a little disappointed, but he said Ponson had a good reason to stay home. Ryan wanted Ponson, who has struggled the past three seasons, in town for several reasons. He wanted to see what shape he was in. He wanted Ponson to meet his teammates. And he wanted Ponson to see how excited th e fan base is. The Twins hope Ponson thrives off the atmosphere in town and the camaraderie among teammates enough that it brings out the talented sinkerballer who went 17-12 in 2003." Buster Olney quips, “This will raise questions, going into spring training, about what kind of condition Ponson is in”. It may or may not be a big deal, but let’s hope it’s not. 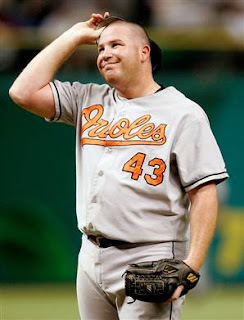 I’m one of few Orioles fans who hope the man works out his issues and shows the promise he had with the team way back when. He’s still young enough to turn the tide, but hope he’s got the will power, discipline and guidance to get himself together. 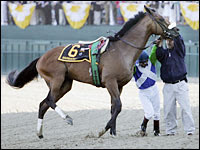 Barbaro: Barbaro was put to sleep Monday after complications from his awful injury at the 2006 Preakness. Doctors tried in vain to keep him alive and get him into hea lth, but the ordeal was too much for the horse to bear. In the end, I can understand why it was done. Even though people will say "it's just a horse", if you're a pet owner of any kind, losing your pet would be like losing one of your children and the trauma is indeed very real. The O’s Sign a Minor Leaguer: According to the Baltimore Sun, the Orioles claimed pitcher Jeremy Guthrie off waivers from the Cleveland Indians yesterday and added the right-hander to the 40-man roster. Jim Duqette quipped: "We like him," … “He's a guy who our scouts think has two to three above-average pitches. He threw 94 to 95 miles an hour the past year. To this point, he hasn't put it together, but we are very optimistic." For the most part, this is an okay move. Right now, we need to focus on rebuilding the minors as well the big league team and any guy who can throw in the mid-90’s is worth taking a look at. Other O’s Stuffage: As well from the Sun, the Os reached one-year agreements with four players: outfielders Nick Markakis, Adam Stern, and pitchers Kurt Birkins and Ryan Keefer. As well, the team announced that they will invite catchers Eli Whiteside and Ryan Hubele, outfielder Cory Keylor and pitchers Garrett Olson and Radhames Liz to spring training camp. More Indecision from the Rocket: Well, once again, the biggest mercenary in sports, Roger Clemens is indecisive as to when he’ll come back or pitch in 2007. Although he donned Astros gear and threw for more than an hour in a minor league workout at Minute Maid Park, he asserted he’s not ready for baseball yet. He’ll be back, as the money is too good. It just depends where, and you have to remember he did the same song and dance with the Rangers and Astros last year. Ok, I am very behind. After a long day and following the Nationals all day for another blog, I am finally getting to updating the site before dreamland. Thanks to everyone who has left me comments, taken a look at my photos and have sent emails in the support of the blog - I greatly appreciate it. * The Orioles.com website has an article by Spencer Fordin on Markakis signing a deal for 2007, along with roster and spring training info. He also updates the mailbag on Mora's status, the bullpen, John Parrish and Rodrigo Lopez. * Roch Kutbako has some Oriole news in his blog. * Ben of Oriole Central has a funny, satirical post on junk mail and relates it to the O's. * Yankees' Chick has a debate on whether the Red Sox are like the Yankees, and I agree her as much it pains me to do do. * Here's my writeup on the Nats' Caravan - I met Ryan Zimmerman and he impressed me a great deal. Did you really think he was going to leave? The Giants and Barry Bonds have completed their deal. Ah, the marriage of convenience goes on for more year. Helton Ain't Going to Beantown: It looks like the deal is dead between the Rockies and Red Sox, but it was great to chat about it while it lasted. The Return of an Old Friend: Sammy Sosa and the Rangers agreed to a minor league contract that was to be announced Tuesday. He will have to go to spring training and earn his spot on the roster with the Rangers, though. For those who bleed the Cubbie Blue, it was another season in a continuous line of disappointment in 2006. With a last place finish in the National League Central, Cubs GM Jim Hendry instituted a radical change in the roster. With the Cubs not having won the World Series since 1908, and not having an appearance in it since 1945, the folks in Chicago are now becoming restless and wondering if and when they’ll ever see a trophy. As the Cubs have been criticized in the past for not spending any money on premier talent, and only looking to make a buck and fill seats; this winter the Cubs spent about $300 million in acquiring free agents and talent in hopes of winning the NL Central and getting back into the World Series. Dusty Baker who led the Cubs to the playoff in 2003 is out; Lou Piniella who was lured out of the broadcast booth is now the Cubs new manager. The team spent a lot of money this offseason to secure free agents like Alfonso Soriano, Ted Lilly, Mark DeRosa & Jason Marquis. The Cubs also spent big money to re-sign Aramis Ramirez, Kerry Wood and Wade Miller. The offense should be greatly improved to complement a hopefully healthy Derek Lee. The Cubs last year were killed by injuries, lack of offense and poor pitching production. Gone from the team is Juan Pierre who signed a huge deal with the Dodgers, and Greg Maddux who was traded to the Dodgers in July of '06. As much as the Cubs spent in the offseason, the offense may score a lot of runs, but the pitching situation is still shaky as ever. The starting rotation is anchored by Carlos Zambrano, who is probably one of the best starters in the game. He went 16-7 with a mid 3 ERA, and his wins accounted for nearly a quarter of their wins. For the Cubs to have a shot at the postseason in ’07, Carlos needs to be on. In addition to being a free agent in 2008, it is unknown whether the Cubs will re-sign him, but a good season from him will set up an even larger payday from what he’s expecting already. After Zambrano, the Cubs go into the unknown in terms of their rotation. Ted Lilly was one of the ballyhooed free agents signed by the team and was given a contract that many thought was a bit much for his abilities. He finished with a 15-13 record and a 4.31 ERA, and he could do slightly better in the NL, his track record shows that he should finish a few games over .500 with an ERA in the 4’s. The Cubs will need to rely on him to win games and pitch quality outings. Jason Marquis is a coming a very poor year with the Cardinals, as he was 14-16 with an ERA at 6. He was so bad and unreliable in ’06 that the Cardinals left their longtime pitcher off the playoff roster. He’ll be one of the wild cards in the rotation as he really needs to be a lot better than he was in 2006. His history shows that he should bounce back and keep in line with his career numbers. It is critical that he pitch well in 2007 in order for the Cubs to be contenders. The other wild cards in the rotation include Mark Prior and Wade Miller, as both men are trying to recover from injuries and a poor 2006 season. Mark Prior who showed flashes of brilliance in his career, and once won 18 games, struggled to come back in ’06 only winning 1 game and losing 7 along with an ERA over 7. In addition, his pitching looked flat and he was hit hard. Hopefully, he can come back from his bad ’06 and produce in ’07. He’s only 26 and perhaps could regain some of the magic and form that made him seem like the “next big thing” before all his problems. As well, Wade Miller will be trying to come back from injuries as he only pitched in a handful of games before missing the rest of the season. If both Prior and Miller can contribute for the Cubs, then the team might be in decent shape. Other contributors to the starting rotation may be Rich Hill who was 6-7 with a 4 ERA along Sean Marshall and Carlos Marmol. The latter two pitchers struggled in the majors, as they got called up due to the rash of injuries and ineffective pitching of the regular starters. Both may be in Iowa pitching in ’07 to get some more seasoning. Let’s move onto the bullpen. The bullpen was another component of the Cubs shaky pitching corps, although Bobby Howry and Scott Eyre had a good year. The closer, Ryan Dempster struggled in ’06 with 24 saves to go along with a 4.81 ERA and 9 losses. He pitched well in 2005, but however regressed last season. He’ll need to improve going into next season, or he may sent on his way out of Chicago. The wild card in the bullpen will be Kerry Wood. He got notoriety as a young starter who once fanned 20 batters in a game, but has been struggling with injuries for the past couple of seasons. As it is, his days as a starter are probably over and he re-signed with the Cubs to work in the bullpen. With Wood in the bullpen, the Cubs are hoping he can stay healthy and not have to face the wear and tear he would have otherwise as a starter. He’s still got decent stuff and at this point in his career, if he rebounds, he could become a force as a reliever. Other members of the Cubs bullpen include Neil Cotts who came across town as he played for the White Sox for the past few seasons, Will Ohman, Roberto Novoa, and possibly Jae Kuk Ryu, Michael Weurtz and Angel Guzman. Another major focus of the offseason was upgrading the offense. The major cog in the Cub offense, Derek Lee missed significant time with a wrist injury and then having to face an illness with his young daughter. This time, Derek Lee is healthy and ready to help the Cubs win. In 2005, he hit .335, 46 homers, 107 RBI, while in ’06 he only managed 8 homers and a .286 average. If Lee can return to his ’05 form, the rest of the offense should follow suit. The newest addition, Alfonso Soriano is coming off a career year with the Nationals, after an initial rocky start as he was forced to the outfield. Alfonso hit 46 homers, 95 RBI playing while playing in cavernous RFK Stadium, along with 40 plus stolen bases. He’s right now one of the most electric players in the game, but he might struggle a little in the outfield, and his strikeout rate along with his on-base percentage may not be ideal, but the power makes up for it. He signed a huge 8 year, 136 million dollar deal and the fear will be in year 5 and beyond if he starts to age and regress. For now, he should pay the Cubs great dividends. The other big powerhouse of the order is the recently re-signed Aramis Ramirez. He’ll strike fear with opposing teams, as he hit .291 with 38 homers 119 RBI in ’06. He’s only 28, and he recently signed with the Cubs for another 5 years; therefore, he should only get better as well become one of the premier power hitters in the Majors. In ’07, Ramirez should provide ample protection for Derek Lee in the lineup. Aside from Ramirez at third, and Lee at first, the infield for the Cubs should have Cesar Iztruris at short shop and Mark De Rosa at second. Izturis is a slick fielding shortstop, but basically will bat at the bottom of the order as he’s got limited power with a lifetime .259 batting average. Mark De Rosa should do fairly well in Chicago as he batted .296 with some pop for the Texas Rangers. With playing in Texas, he blossomed and hopefully the Cubs will see his success translate from the AL to the NL. The outfield including Alfonso Soriano should see Matt Murton, Jacque Jones or Cliff Floyd starting. Murton had a good year where he almost batted .300, drove in 62 runs and had some power. He may platoon in the outfield with Floyd in town, but he was consistent in 2006 and should garner lots of playing time. Jacque Jones slammed 27 homers with 84 RBIs and hit .285, but his on-base percentage was tad below average and he doesn’t draw walks at all, but still is a good bat with some pop. The wild card in the outfield will be Cliff Floyd. A hitter with amazing power, he’s has problems staying healthy throughout his entire career. Floyd only hit 11 homers and .244 due to being injured, but if he’s intact, he can smash the ball. He played 150 games in 2005 with 34 homers and 98 RBI, so he being healthy and able to contribute is not too far fetched. Floyd signed a contract with the team which pays quite a bit of incentives, so with a deep bench, Floyd may not have to play every day and expose himself to injury. Also on the bench for the outfield will be Angel Pagan and longtime veteran Daryl Ward who can either play the corner positions or first. The regular catcher is Michael Barrett. He batted over .300 with some pop and 53 RBIs. He was steady throughout 2006 and the Cubs will need him to be at the same level or better in ’07. Henry Blanco will be his backup. The Cubs in 2007 should have an improved team, but with the Cardinals and Astros in the National League Central, things may be tough. 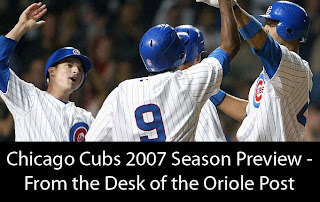 However, based on the results of 2006, the division may be wide open next season and with questions concerning the Cubs and Astros, the Cubs might be back in the playoffs if all goes right and the team can stay healthy. Derek Lee and others must stay healthy, Soriano needs to duplicate what he did in Washington, and the starting pitching outside of Carlos Zambrano must come together and be consistent. Lou Piniella has a great track with a World Series win, so big things should be expected – but, however, can the Cubs get closer to erasing the curse of the Billy Goat? It remains to be seen. Sorry for the lack of activity this morning, I had a travel to see a client with my everyday job, as well as cover the Nationals' Winter Caravan at the University of Maryland this afternoon. I'll have the Chicago Cubs done tonight, but at the moment, I am very much behind with things. Okay, Schill. I’m sure Boston will be happy, but Yanks fans, um, not so much. Bonds a Giant - could it not be any other way? Barry Bonds is expected to complete the final negotiations towards a new contract for ’07. Much of the delay could be attributed to federal probe of him and his drug use, along with the recent positive test for amphetamines. Orioles Updates from Roch Kubatko: Roch Kubatko updates us on some former Orioles, pitchers around the league and more FanFest stuff. The city of Brotherly Love saw their hometown team, the Phillies contend valiantly for a wild card spot in 2006, but fell a couple of games short. The team had a poor first half in which they found themselves jettisoning off several players such as Bobby Abreu, the late Cory Lidle, David Bell, Rheal Cormier, Dave Delucci and a few others. Most experts and pundits figured that the Phillies threw in towel near the trading deadline & waved the white flag for surrender. The players had other plans as the team was white hot from late summer into September and were wild card contenders until the last week of the regular season under the tutelage of manager, Charlie Manuel. Thanks to the emergence of Ryan Howard as one of the premier run producers & home run hitters, to the equally amazing Chase Utley, who carried a 36 hit streak and had a career year, the Phillies should be in great shape to contend in the National League this upcoming season. The Phillies under the guidance of GM Pat Gillick made some big moves in the winter adding Freddy Garcia, Adam Eaton to shore up a rotation that should help the team improve on their 85 win season. The starting pitching has gone through a number of changes which were made to improve the team. The rotation has gone through a complete makeover, with Brett Myers being the only pitcher who started the season with the team in ’06. Jamie Moyer came to the Phillies via trade and Cole Hamels was brought up from the minors last season. Meanwhile, the Phillies got Freddy Garcia in an offeseason trade and Adam Eaton came to Philadelphia in a controversial free agent deal. The anchor of the rotation will be the newest member of the team, Freddy Garcia. Coming off a 17-9 campaign with an ERA in the mid-4 range, he’ll need to perform like he has in the past while in Chicago for the Phillies to compete. Brett Myers had a decent 2006 with 12 wins and an ERA under 4, but had problems with his marriage during the season which led him to having to take time off. If he can perform or exceed his numbers last season, the team will accept that. Well traveled veteran Jamie Moyer returns again to the team after a good year with the Phillies. He does not have overpowering stuff, so he’ll need his curveball and change-up to be successful; therefore, the team will need him to be consistent and have quality outings. Young Cole Hamels will be expected to take his game to the next level in ’07 after having a good ’06 at the major league level. The big unknown in the rotation right now is John Leiber. He’s coming off a subpar season in ’06 and there’s talk he’ll traded before the season for relief help. However, he has a decent track record and should still be able to help the Phillies, or could be used a a trade chip. The wildcard in the rotation is Adam Eaton. The signing of Eaton was widely criticized in baseball, as he has never pitched over 200 innings and missed part of ’06 with injury. He’s got decent stuff, but is only a few games over .500 for his career. Eaton will need to step up his game big time and contribute to the Phillies quest for the playoffs. The bullpen for 2007 is in flux at the moment. Well, Tom Gordon will be closing games again in 2007, after a year where recorded 34 saves. 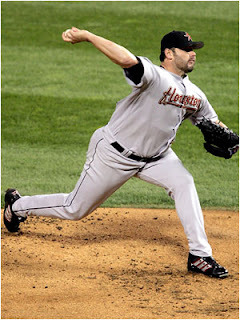 Ryan Madsen will return as the setup man after being going back and forth between being a starter and reliever in ’06. Other members of the unit will include Matt Smith & longtime veteran Antonio Alfonseca. Pitchers Eude Brito, Fabio Castro, JimWarden, Alfredo Simon & Anderson Garcia will battle for a spot for possible openings in the bullpen. Let’s move to the starting lineup. The lineup has its core hitters in place, as superstar and National League MVP Ryan Howard returns to follow up on amazing 2006, along with Chase Utley who had a career year, Jimmy Rollins & Aaron Rowland. Pat Burrell had good numbers, but struggled at times, especially in key situations. 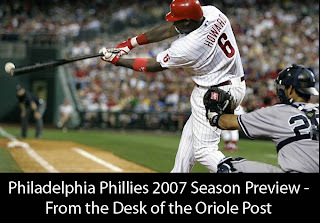 The main weapon in the lineup will be Ryan Howard, who had a team record 58 homers and 149 RBIs. Needless to say, the Phillies would have not been successful in 2006 without him and hopefully he can continue his great numbers in ’07 and beyond. One of my personal favorites, Howard not only hits homeruns – he crushes them, and he captured the imagination of America through his exploits. The rate he’s going now, his ceiling is limitless and we could be talking about one the greatest sluggers to have ever played the game once all is said and done. Chase Utley also broke out in ’06 and became a household name as he hit 32 homers with 102 RBIs, as well with a 35 game hitting streak. He along with Ryan helped the Phillies come back surge for a playoff spot in the National League only to come up short. He recently got a huge contract extension and should be part of the core of the team for seasons to come. Jimmy Rollins will play shortstop as he also had a great ’06 with 25 home runs and 83 RBIs, and was a pleasant surprise on the offensive front. If he can duplicate or exceed his numbers last season, he’ll be another part that will compliment the Philly offense nicely. With the trio of Rollins, Utley and Howard, the Phillies should not only have a great up-the-middle combo, but also one of the premier offensive infields in the game. Manning third base will be Wes Helms as he had a great season hitting .329 along with 10 homeruns and 47 RBIs. He’ll be expected to maintain that same level in ’07 at the plate. Also on the bench for the infield will be Abraham Nunez, & Danny Sandoval. The outfield will be manned by Pat Burrell, Shane Victorino & Aaron Rowand and the wildcard in the scheme of things will be Pat Burrell. Pat Burrell, mentioned earlier, struggled in the clutch and with men on base, but he still hit 29 homers and drove in close to 100 runs. However, he was often the name used to trade talks, as he was seen as a malcontent and could not produce in key moments. As he was not moved, he’ll be expected to return and hopefully produce to his potential. Shane Victorino did a decent job while covering for an injured Aaron Rowand. Aaron Rowand became a legend in baseball after breaking his one after making an incredible catch. He spent time on the DL for that injury and hurt his ankle at the end of 2006. He hit .262 and should be back in the fold for ’07 and man center field. The bench for the outfield may consist of Michael Bourn, Jayson Werth, & Chris Roberson. The catching situation is different in 2007, as longtime veteran Mike Leiberthal left the team and the Phillies signed Ron Barajas from Toronto. He had a solid year in Toronto and he’ll be expected to translate his numbers in the AL to the NL. 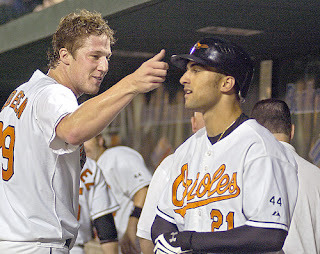 Serving as his backup will be Carlos Ruiz, or one of the better stories of 2006, Chris Coate who batted .328. Pat Gillick spent the winter to try to build a team that will contend for ’06, however, he may not have gotten the pieces he needed. Even though the Mets are the powerhouse team of the division, the Phillies may serve as a dark horse to win the division and as well contend for a playoff sport. The team must avoid a start like last year, and the offense needs to produce like last year. Big things are expected of Ryan Howard, Chase Utley, Jimmy Rollins and Pat Burrell, so if the offense and pitching can come together, Philly might have a playoff spot reserved for them in ’07. Wow. I caught this after surfing around the web and various forums just right now. For example, if you’re an O’s fan and shout “O” during the National Anthem while at RFK, you will get a lot of heat from Washingtonians. A quick review: Peter Angelos fought tooth and nail to prevent the Montreal Expos (who became later the Washington Nationals) from moving to Washington D.C. as the team would be encroaching on his territory. MLB only moved the team to the nation’s capital for the fact there was no other viable market that could sustain a team and have a facility up and ready to play in. As a concession for the Expos moving to into Washington D.C., MLB set up a regional sports network, MASN, for both the Orioles and Nationals, but Peter Angelos and the Oriole would own the majority of the network permanently. Also, the Orioles now could not be sold at open market for less than $365 million, almost double the amount the team was originally purchased for. In addition, the vast majority of fans could not see the Nationals until late 2006, as MASN and Comcast, a cable provider fought over a contract over Orioles coverage in 2007 and beyond, so Comcast refused to put MASN on their cable systems. The experience of the cable network along with the fight to get the Expos into Washington led D.C. area to resent bitterness and hatred towards Angelos along with the Baltimore Orioles. A lot of Orioles fans who lived in Maryland, D.C. and Northern Virginia became Nationals fans, as some were former Senators fans, some wanted to root for a team in their own vicinity, as well a few did because there were not satisfied with the team under ownership with Angelos. Was it a bit crass and immature for some angry D.C. fans to rail against Nick Markakis and Adam Loewen, two young players who have nothing to do with the Orioles and their business practices? Yes, but it is America, and sports fans have the right to voice their displeasure. I can not criticize Washington area fans for their anger, because in my mind it is in a way rightly justified and sports is an emotional thing in people’s lives. However, as I look at things from Angelos’ view and in a corporate sense, the moves he made were smart and in a way, he needed to protect his investment. Now, I am not agreeing in the way he conducted himself, but a lot of what did made sense and with his skills as a lawyer, he surely did benefit greatly from the Expos moving into the Mid-Atlantic region although the Orioles have not been competitive and attendance has dropped greatly. In the end though, it comes back to Markakis and Loewen were sadly the target of the ire of Peter Angelos. Did they deserve it – no; but nevertheless, the incident is representative of what the Orioles face in Washington D.C. I have decided to compile a list of my favorite old school ball-players who played from 1970 and beyond. Anyhow, I figured it would be fun to start up a list as I’m not really doing much this afternoon and I saw quite a bit of baseball nostalgia yesterday. The list I drew up are players that impressed me, and while they may or may not have been necessarily the best at their respective positions, as a kid or seeing them on video, they left an indelible impression in my mind. I left members of the Baltimore Orioles off this list, since I’ll have one for them in the next week or so. Rickey Henderson: The greatest base stealer of all-time, and one of the most dangerous leadoff hitters to ever play baseball, his mixture of speed and power made the game that much more exciting to watch. My favorite thing about him was his uncanny ability to speak in third person. Dave Winfield: The dude always scared me because of his height and stature (ok, I’m 6’4” as an adult; but when you’re young, when you saw him up close, he might as well been seen a redwood). However, he was a great player with who used all 5 tools with efficiency. He’s a class act and played the game with heart. Mike Schmidt: He manned the hot corner in Philly, and even though at times he was booed, as most Philly athletes outside of Allen Iverson were, he delivered when it counted. Goose Gossage: He had the wicked fu Manchu, the glare & the gaze. As we all know, he was a hell of a relief pitcher and I thought honestly he was a bit mad (ok, he looked a bit mad). Could you think of a more intimidating presence on the mound when he played? 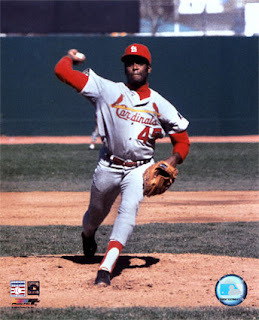 Bob Gibson: Although I was not born when he played, I think he’s the man. He was like the enforcer, you know like the guy you’d always pick first in grade school for dodgeball just because you were going to win. With his assortment of pitches and his deadly fastball, the Cardinals more often than not won with him on the mound. The lord of intimidation with scary presence, he never smiled, always showed who was in charge and you always had the chance of getting drilled. Hank Aaron: The Hammer. As we all know, he is the all-time Major League Baseball home run hitter, but he’s handled the obstacles he faced (racism, death threats before he broke the record) with dignity, class and grace. He’s the epitome of all ballplayers, past or present. Below is a video of Hank Aaron homering. Nolan Ryan: He was my favorite pitcher to watch back in the day, and I was in awe of him. Even though some of my friends find him to be overrated, you knew that there was a chance something special might happen whenever he was on the mound. The man pitched through 4 decades and more often that not, he was utterly dominant. My infamous memory of Nolan Ryan was when he got Robin Ventura of the White Sox into a headlock and pummeled a few roundhouses on him, after Ventura charged the mound while being beaned. Considering Nolan was probably at least a good 15 or more years older than Ventura, it was quite amazing to see him to do that and it also cemented Nolan’s reputation as a tough man. Pete Rose: Although he is banished from the Hall of Fame for life, he was not doubt the hardest working ballplayer I ever witnessed on tape. Here’s Pete in a commercial from 1977. 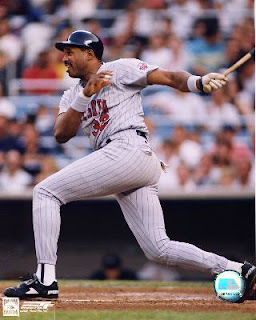 Kirby Puckett: Small in stature, but big in power and heart. He looked like an everyman, though a little more built, and played the game with unbridled passion and love. He seemed to always enjoy himself and was no doubt the leader of the Twins in the 80’s and early 90’s. Ozzie Smith: He was the man in the infield and his defensive wizardry will always live in my mind. He was no doubt, a human highlight film. Rod Carew: He was another small guy: but boy, could he hit. George Brett: See Rod Carew and I will never forget his “pine tar incident”. Frank Howard: He was the punisher down in Washington and hit the ball probably further than any other ballplayers, perhaps outside of Mantle and Ruth. Tim “Rock” Raines: He may have been the complete ballplayer, and he was amazing to watch. Sorry for the delay in the updates, I was out most of Saturday throughout the day and later in the evening. I’ll try to have a Phillies team review by Monday. This upcoming week, I’ll do the Chicago White Sox, Atlanta Braves, Chicago Cubs and the San Francisco Giants. Helton in Fenw ay? The Denver Post reports Rockie mainstay Todd Helton may be leaving the Rocky Mountains and heading to Boston. Helton has another *6* years and $90 million on his current contract with Colorado, but would waive it to go to the Red Sox. Todd Helton has always been a good hitter, but his numbers are in decline, as he hit .302 last year, his lowest batting average since his rookie and his power has been zapped. However, Boston’s deep coffers can to subsidize this deal and his presence would make a great team on paper immaculate and possibly be better than the Yankees. In addition, with the short distance to the right field wall and the American League being so offensive based, his numbers might rise. Right now, Colorado may simply seek out Boston’s young guns like Craig Hansen, other prospects, or someone like a Mike Lowell. In turn, the Rockies will most likely get pitching, but does ridding of Helton make them any better? Weaver a Mariner. World Series hero Jeff Weaver & the Mariners have just about finalized a one-year deal worth $8,325,000 (the same salary he had last year). Like I said in a previous post, ‘buyer beware’ with his track record, as three postseason games do not make a career. Keep in mind, he got deposed from the Angels in '06 partly because of being so bad and in favor o his brother, Jered. In 2006, Omar Minaya with the blessing of the Wilpon family went out and built a team constructed for the World Series. The Mets were often looked at as the second team in the Big Apple, but due to their impressive season, they stirred up excitement in the city that never sleeps. However, in the NLCS, but lost out to a St. Louis team that won only 83 games. Although, the Mets have youngsters David Wright and Jose Reyes becoming stars, they are a team pretty much built to win now. With the contract extension recently given to Willie Randolph, he’s now got the security to lead the Mets corps for the near future. Right now, the pitching situation is one that is of most concern. Ace Pedro Martinez on the shelf until summer, the Mets have two men in middle age in the rotation, and the rest of the pitching staff is unsettled. Although the pitching situation is shaky, the Mets probably have the best offense in the National League and that alone should get the team many wins. The Mets also dealt with a number of injuries last year, but hopefully this offseason gave a chance for some players to rest, relax and come back strong in ’07. The team let quite a few players go such as pitchers Brian Bannister, Darren Oliver, Chad Bradford, Roberto Hernandez, Steve Trachsel, outfielder Cliff Floyd and infielder Chris Woodward. The offense is pretty much the same from last season, with Moises Alou taking the place of Floyd. In light of it all, the Mets are favorites to win the NL East, although Philadelphia is also a contender, and the Braves could be a dark horse if things line for up for them. Let’s start with the pitching rotation. In terms of pitching, 2006 was a great year for the Mets, but however had to struggle with patching together a staff throughout the season due to injuries. Tom Glavine, in his 40’s pitched well and is en route to 300 wins; Orlando Hernandez also near the watershed age of 40 was able to contribute, but got injured in the playoffs. John Maine, a former Oriole broke through and Pirate castoff Oliver Perez was a pleasant surprise in the playoffs. However, the injury bug hit the Mets as ace Pedro Martinez started off hot, but cooled and then wound up injured and out for the rest of 2006. He’s been out with a torn labrum and will be back in the fold perhaps by summer. Brian Bannister also started out well, but ended up injured and he’s no longer with the team. Considering the events of 2006, the Mets knew they needed pitching, but however, the market was needless to say expensive. Even though the Mets have the funds to spend with anyone, they held off because of some of the questionable talent available. The Mets tried to go after Barry Zito and Jason Schmidt, but were unable to get either. The ace of the staff right now is Tom Glavine. He was 15-7 with a 3.82 ERA and he bounced back after 2 years of struggling to a sub-par record. He may not be as good as he once was; his curveball and changeup are what get him wins. Considering his age, there’s no reason to believe he cannot duplicate the success of 2006. Although he’s got a great defense behind him along with offense, it’s critical he does well. Orlando Hernandez will be a starter as well, and he’ll need to be consistent as well. He does not have overpowering stuff, but like Glavine, he’s got an amazing curveball and changeup and as well succeeds with deception and guile. John Maine will be another starter and he’ll need to stay at the level he was at in 2006 or perform better. The wild cards in the pitching rotation will be Mike Pelfrey and possibly Philip Humber. Pelfrey showed flashes of brilliance in 2006 and will probably be slotted in the rotation. Humber is a youngster and will also be ready at some point to perform at next level. I’d expect these two play a role in the future of the New York Mets. Oliver Perez may also be in the rotation, but he might end up in the bullpen or perhaps even the minors. The bullpen for the Mets was a source of strength and helped the Mets to stay and finish up games. With a 3.25 ERA, they shout down teams and for the most part, when the Mets led they won. Led by the amazing Billy Wagner and his 100 mph-plus fastball, he saved 40 games and struck out well over a batter per inning. He’ll be expected to dominate like he did in 2006 for the upcoming season, and although he’s getting up in age, there’s no reason to believe why he still not be anything but effective for the next couple of years. Aaron Heilman will be the setup guy, and the bullpen will consist of Duaner Sanchez who is coming back from injury, the recently signed Scott Schoenweis, Jorge Sosa, Pedro Feliciano had a sub 2 ERA in ’06, Guillermo Mota who will serve a 50 game suspension at the onset of start of the season, and possibly Dave Williams, Juan Padilla, & Jon Adkins. Let’s move onto the starting lineup. The Mets last season had an amazing offense which I considered to the best and most formidable in the National League. It seemed every night a Met was doing something to win a game, whether it was a key hit or a home run. Carlos Beltran bounced back from a sub-par 2005 where he was constantly in the papers and tabloids over his performance, to 2006 as he showed the league his limitless potential and earned the respect of Mets fans. Beltran showed he was worth his salary as he hit 41 homers with 116 RBI along with spectacular defense. Meanwhile, youngsters David Wright and Jose Reyes who man the left side of the infield broke through big and were a main reason for the Mets run last season. Wright in only his second year entered the superstar stratosphere with 116 RBIs along with 26 homeruns. There may possibly be no limit to his ceiling and New York Met fans can only see bigger and better things from Mr. Wright. Although he slowed down during the second half, he’s a complete 5 tool player who will no doubt be a multiple time All-Star. The man who plays to the left of him, Jose Reyes, also broke out in 2006 and sometimes made Shea a party atmosphere. Blessed with great speed, a slick glove and superb bat, he led the league in triples, and showed power as he hit 19 home runs, along with stole many bases and over 80 runs. He’s another 5 tool guy who can only get better, and Reyes definitely makes the game fun and entertaining. As usual, he’ll be the leadoff guy. Carlos Delgado signed with the team in 2006, and while he only hit .265, he hit 38 bombs and 114 RBI and became a feared part of the Mets arsenal. A long time Blue Jay, he was always known for his consistency and he was able to continue his body of work in New York City. Even though he’s now in his mid 30’s, he should be able to perform at the same level for at least a few more years. The newest addition to the Mets, Moises Alou will be manning left field. Always a player blessed with great baseball instincts and with the ability to produce numbers, his injury history is always going to be a concern, and he’s sat out parts of seasons recently with various ailments. The Mets will probably give him several off days, as he’s now entering middle-age, but his track record shows that he will no doubt be productive. He’s only signed for one year, and should provide the Mets with another tool in their offensive arsenal. The Mets probably replaced one oft-injured player with another, but they should expect Alou to match or possibly exceed Floyd’s stats. Paul LoDuca will probably be the bottom of the order. He calls a great game and is steady with the bat. Although he had issues with his marriage that ended and gambling, that didn’t affect his game and he was an important cog with the team, although he does not have a big bat like Beltran or Wright. The wild card in the lineup is Jose Valentin. He had a surprising 2006, as he hit .271 and had some huge hits. He bounced back after a few sub-par seasons before joining the Mets. He took over second after Bret Boone was a failure and Kaz Matsui was traded. Will age catch up with him, or can he follow up with a successful 2007 campaign. The Mets are blessed with an excellent bench, and they played a role to the Mets’ winning season. Ageless Julio Franco is defying Father Time and is a prime example that age may be nothing but a number. He’ll play sparingly, but in 2006 he came in huge in some situations, primarily with pinch hitting. Endy Chavez had one of the greatest catches I have ever seen when he robbed Scott Rolen of a homerun during the NLCS. He’s a serviceable bench guy, but at times you saw his flaws at the plate. Occupying the bench will be longtime veteran infielder Damion Easley, David Newhan, Anderson Hernandez and Ben Johnson. Super hyped rookie Lastings Milledge may also play a role on the team, but he battled with inconsistency at the plate and some on the team has issues with him and later on the summer he got sent to the minors; therefore, it is unknown whether he’ll be on the team, in the minors of possibly traded. Based on the outcome of 2006, the Mets and their fans expect big things in 2007 with the end result being a World Series. The Mets should be the favorites once again, although with their shortfalls, on paper they are, if not, the best team in the National League. In the end, although they have one of highest payrolls in the game and it’s assumed that they will win a lot of games, getting to the World Series is easier said than done. Omar and company will need the offense to produce as they did last season, and the starting pitching needs to hold up. I just got home from the Baseball’s Best Memorabilia/Autograph show along with the Ripken Coaching Experience at the Baltimore Convention Center, and I’ll tell you I had one the longest, but yet, most enjoyable days I have ever had. The first part of the morning was spent looking at memorabilia & the autograph show. I found the memorabilia show quite boring, but there were plenty of exhibits to see along with artifacts, pictures and stuff to buy. I ended up getting prints with signatures of Stan Musial, Brooks Robinson, Frank Robinson, Cal Ripken and Jim Palmer. The morning was pretty much ho-hum. However, I did get a chance to chat with the Baltimore Sun’s Roch Kubatko and we talked about mostly Orioles baseball. Later on, I ventured into a separate room where the autograph portion was taking place. 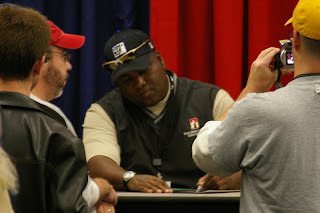 You had to buy a ticket to even enter the room, and I ended up giving in and got an autograph of Tony Gwynn. Anyhow, I spent about an hour or so taking pictures of the festivities in the room, and in my time there, I saw Cal Ripken, Tony Gwynn, Tony Gwynn Jr. Jim Palmer, Rick Dempsey, Eddie Murray, Frank Robinson, Tom Seaver, Johnny Bench, Don Mattingly, Preston Mattingly, Mike Boddicker and Al Bumbry all in one room. Wow. I was just taking it all in. After taking a break for lunch, I went to take part in the Ripken Coaching Experience & Seminar. The event took place in three separate rooms and each had a theme – hitting, pitching and fielding. Upon checking in, each participant got a packet which included a maual and some advertisements. 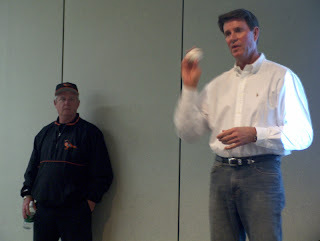 Taking part in the seminar were the family Ripken, Cal and Bill along with Don Mattingly, Jim Palmer, former Orioles Scott McGregor, John Habyan, Hall of Famer Jim Palmer, and Doug DeCinces. The seminar was mostly geared to coaches who work with kids and teens, along with parents, but fans also took part in a chance to learn the game and meet their idols. Having the opportunity to take part in the coaching seminar, I got learn a little more about the fundamentals of the game, but more importantly, got to hear the pros expound on their philosophy of what helped them at the highest levels. Much of the principles that the Ripkens’ shared with the participants follow the parables of the “Oriole Way” and the influence of their father, Cal Ripken Sr. The seminar covered all aspects of the game by the pros that included pitching, hitting, & fielding fundamentals, along with working with kids/teens. It was amazing the wealth of knowledge shared by the pros, hearing a lot of their stories on the field, teaching kids and taking an interactive part in the seminar. There was ample opportunity to ask questions along with share comments, so quite a few people took a chance to ask the instructors whatever they wanted to know about pitching, hitting, fielding and whatever was on their mind. The highlight of the event for me was having the opportunity to shake Cal Ripken’s hand and tell him congratulations on being voted into the Hall of Fame. 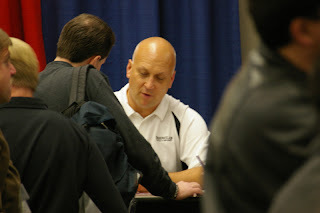 However, the best part of the seminar was Billy Ripken. As much as I love Cal, Bill was absolutely entertaining and livened things with Doug DeCinces with his stories, and funny, boisterous attitude in conjunction with the instructional material. He made things absolutely memorable by joking with the audience and just having fun. Having the chance to just hear stories of particular incidents, games and events from the perspective of a player, especially ones you followed growing up just amazes and draws you into the experience. The Ripken Coaching Experience and Seminar was a once in a lifetime opportunity, and taking part in it is something I will always remember. Having the chance meet both Cal and Bill Ripken in person, along with meeting Don Mattingly, Jim Palmer and Doug DeCinces is a dream for any fan, but learning the fundamentals and parables of the game from them in person is priceless. 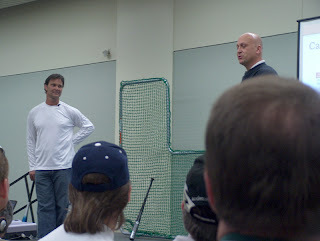 Notes from the Event: Two people from ‘Yankees On Deck’ (not sure if it is a show, or website) got the opportunity to ask Cal Ripken about the “Streak” and he gave an honest, open answer concerning it from his perspective. Cal said that it was nothing he ever aspired to doing, it just came about from his willingness to play & having the opportunity to be in the lineup every day. As well, he asserted that it took a life of its own and admitted in a sense the “Streak” might have hurt the team at times when he struggled. Cal Ripken even considered ending it if really hurt the team, and one point nearly stopped it when he struggled mightily, but his wife talked him out of doing it. More Stuffage: Here's an article from the Baltimore Sun's Roch Kubatko about the events today, and his blog entry. Cal Ripken and Tony Gwynn Raise Money for Charity in Baltimore: Tonight in Baltimore, Cal Ripken Jr. and Tony Gwynn held a press conference & dinner to highlight the Aspire Gala, and theme of the evening was "A Tribute to Life's Coaches,"to raise money for the Cal Ripken Sr. Foundation. The event was not open to the public, but other baseball players, Hall of Famers, dignitaries and business leaders attended and raised about $1 million for the foundation and charity. The event was held in conjunction with the Baseball's Best 2007 Show being held in Baltimore this weekend. Brian Roberts: Roch Kubatko from the Baltimore Sun updates us on the Brian Roberts contract extension talks and there's really no movement on that front. Catching Up With An Old Friend... Arthur Rhodes agreed Thursday to a minor league contract with an invitation to spring training for the Seattle Mariners. He'll be in the bullpen & will either be a long reliever or setup man. Nolan Ryan: Baseball pitching legend Nolan Ryan is in the hospital recovering from an undisclosed condition. His son, Reid Ryan said he's at the Round Rock Medical Center in Texas for treatment of recurring symptoms from a pre-existing medical condition. Get well Nolan! Fanfest news - um, there's none to report for now. I called the Orioles a little while ago and I was more or less told, "just keeping checking out the website and an announcement should be made shortly..."
Why there was no a plan B in case of snow, etc. - I have no clue. Here's some insight from Matt Palmer who wrote the article I got the quote from. I would think it might be something done right before Spring Training, or before the season done maybe in a another location that could hold a number of people or the club level of Oriole Park. Are the Yankees Going Red? Some time in the next week, a contingent of staff along with team officials and executives will go to China next week to foster an agreement with China Baseball Association to develop academies and the spread the game. In the long run, the Yankees could develop their own academy and garner a foothold in the communist nation. Ah, isn’t that idea noble? Well, maybe, but there’s an inherent motive in anything, especially with business of baseball being as it is. Kids already play baseball in China, and China/Chinese Taipei have had teams in the Little League World Series and China had a team in the World Baseball Classic. However, the Yankees want China to become another Dominican Republic where baseball is now the sport – just that the team wants to be the first to stake claim to the nation of more than a billion people. The Yankees are looking that plan to develop a pipeline of players and in turn, which will help the game for other teams. The Dodgers and Blue Jays first made inroads in the Dominican and the Latin America, and boon came. The biggest names in baseball, Pujols, Soriano, Guerrero, Tejada and the list goes on all came from that country. Imagine an athlete in China who plays baseball & turns into the next big thing, sort of Yao Ming, and ponder what will do for baseball in China, marketing and the Yankee brand? Also imagine Yankee blue as part of kids’ wardrobes with the NY emblazoned on shirts, hats, etc. Yes, a lot of the deal also has to with branding and marketing, especially as China being such a manufacturing and industrial power, people may be apt to spend their discretionary income on Yankee gear. There’s nothing wrong with the idea of the Yankees going to Japan, but let’s say it for what it is. It’s as much to do about spreading the game, as it is about making money and instilling the values and traditions of those in Pinstripe Nation. I think the Yankees have another aspect of their arsenal to use against the Red Sox in the One Hundred Years Plus and Still Going War. Gordon Edes of the Boston Globe reported tonight that the J.D. Drew deal to Boston has indeed been finalized, five years/$70 million with some protections. *If Drew goes on the disabled list for a shoulder related injury in year three of deal, Sox can void final two years. *If Drew is injured in the fourth year, Sox can void the final year of contract. *The out clause applies only if the injury is shoulder related. It remains to be seen if he will make it through the contract. Based on track his history, the Red Sox may want to have that contract handy and make sure the part about the injuries is highlighted in yellow. His 15 Minutes aren't up yet... Kevin Federline will be in a commercial for Nationwide Insurance during the Super Bowl. He got paid a half-million for it & goes to show that infamy does pay. Jeff Weaver a Mariner? According to CNNSi.com, "The Mariners are closing in on a deal with the 30-year-old right-hander, a baseball official close to the negotiations said Thursday, speaking on condition of anonymity because the contract had not yet been agreed to." He did great in the postseason for St. Louis, but the track record is not that good - buyer beware. Jake Peavy: His disorderly conduct charge was dismissed after the pitcher apologized for a confrontation with a security officer when he double parked to unload baseball gear at Mobile Regional Airport. "Part of me says if they wanted me, they would have made an offer by now," he said in a story published yesterday. "When you play this game for a long time, you take things for granted and think it won't end. But the harsh reality of it is, it will." ... Williams also said, "My case is a little different. When you give a large chunk of your life to a team, it is hard. It's not like I am a journeyman." A Yankee from 1991 through 2006, Williams clearly is hurt by the Yankees' decision. Asked whether he would play for another club, he said, "Yeah, I think I could. The loyalty factor goes both ways. When a team that you've played for doesn't want to offer a contract, it is making a business decision. So I have to make a business decision. Wow. I'd love to see him come back and even though I'm no fan of the Yankees, the man was always class act and seemed to be a genuinely nice person. It looks like he still has the fire and I can imagine him playing another year, but perhaps maybe not in pinstripe blue. After the year he had in 06, it might make sense for him to come back; however, if he leaves now, he'll walk out when he's still got his skills and a Yankee, assuming that means a lot to him. 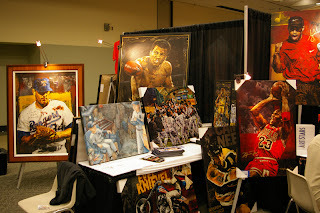 O's News: Not much at all is going on in Oriole land, but Roch Kubatko updated his blog this morning about the baseball show going on here in Baltimore. The ever so-controversial manager of the Chicago White Sox, Ozzie Guillen christened the infelders of the Minnesota Twins the “little piranhas”, because of their style of the play, their tenacity & unwillingness to give in, along with the lack of household names. However, that should probably apply to the whole team. The reasons above are how Minnesota came back from a horrendous April and May where they were well under .500 and pretty much buried to storming back to win the American League Central on the final day of the 2006 season. Under the guidance of manager Ron Gardenhire, and GM Terry Ryan, the small market Twins, despite their lack of resources in comparison to the powerhouse New York Yankees and Boston Red Sox have been able to compete this decade thanks to intelligent scouting along with fostering a culture of winning and nurturing young talent. 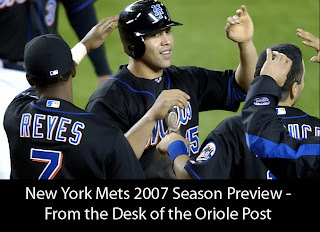 Their amazing second half made for a great story for baseball and an unprecedented run for a division title, but things will probably be even more difficult in 2007. Sadly, the Twins due to their economic standing could not at all be players in free agency this winter and will probably need the same amount of good fortune it had in 2006 to be viable contenders this upcoming season. With the market is as it is right now, the Twins are handcuffed due to arbitration-eligible players, taking on Hunter’s $12 million dollar option, so much of the free agent signings were of journeyman players and reclamation projects. Although the team wound up losing to the Oakland Athletics in the Division Series, the Twins no doubt had an amazing 2006 where hometown boy Joe Mauer won the batting title, Justin Morneau won the MVP, Michael Cuddyer broke out and had a career year, and Johan Santana was his usual dominant self. Minnesota became very scary, as a two headed monster was created in the starting rotation with Johan Santana and superstar rookie, Francisco Liriano. Liriano went down with an elbow injury and missed pretty much the latter half of 2006 and he’s not expected to be back until 2008. As well, longtime Twin, Brad Radke struggled with arm and shoulder problems throughout the season and relied on guile as well as guts to succeed. However, after the playoffs, he decided to retire due to injuries. As we head to spring training, the Twins have a lot of positives going for them, but they once again may have a mountain to climb. The positives are that the Twins really did not lose any of their core players, and much of the starting lineup you saw in 2006 should be back for 2007. With Twin mainstay and human highlight film, Torii Hunter returning, along with the aforementioned Mauer, Morneau, and Cuddyer, the Twins offense should be able to maintain or perhaps even exceed 2006. As well, the Twins also had some young pitching come up the pipeline and contribute as well in both the rotation and bullpen. In light of the positives, the Twins also have a few negative forces to deal with. The forces working against them involve the lack of starting pitching, & with dealing with arbitration-eligible players. Based on the team’s track record in this decade, they might have a very good chance at working through their issues and once again surprise the league. Let’s start with the pitching staff, most notably the rotation. Ace and perennial contender for the Cy Young, Johan Santana, will of course be back and be expected to anchor the team. For the Twins to succeed, it is vital that Johan Santana to keep up the success he’s had previously. The Twins also had young pitchers Boof Bonser and Matt Garza come up from the minor and contribute in the middle of a pennant race, although Garza had some growing pains. Probably now more so than ever, they will need to deliver in 2007 if the team has any chance of competing in the AL Central. The Twins will also need Carlos Silva to come back from a bad 2006 and regain his form in previous seasons. The wild card of the Twins happens to be with well, the rest of the potential starting pitching staff. The team recently signed former Nationals pitcher Ramon Ortiz, former Baltimore, St. Louis and New York Yankee pitcher Sidney Ponson. I am very familiar with the two men, and Ramon’s 2006 numbers look bad, but he’s showed signs of brilliance at times and had a good track record with the Angels. If he can return to the form that he had with the Angels, he might be a diamond in the rough. Sidney Ponson’s troubles have been well chronicled, and he’s got talent, but his vices and poor conditioning have done him in. I would expect him to be in the bullpen and spot starter, but if he fails in Minnesota, this may be the last stop in his career. As well, the Twins have rookies Scott Baker & Glenn Perkins, who might be able to secure starting pitching jobs as well. Both men struggled in the majors, but perhaps another shot at the big time may be motivation for them to pitch well in the majors. The Twins bullpen was real strong last year, and should maintain the same level in 2007. The corps in the pen is led by super Joe Nathan who once again had a dominant year recording 36 saves. He should be good for many years to come and while he’s unknown to casual fans because he plays in Minnesota, the rest of the nation will soon see how good he is. Longtime Twin Juan Rincon, Pat Neshek, Matt Guerrier, Jesse Crain, Dennys Reyes, J.D. Durbin & Jose Mijares will also man the bullpen. The offense for the Twins in the past usually was once of basic fundamentals, and hit & run with not a lot of focus on power. That changed in 2006. The middle of the lineup, Mauer, Morneau and Cuddyer will be the key for the offense. The nation got to see Minnesota native, catcher Joe Mauer break through as he won the batting the title narrowly over Derek Jeter and emerge as a potential star. Mauer will probably bat third, and he at this point may have a limitless ceiling. He will probably hit for more power in 2007 and even improve on his impressive ’06 numbers. He’ll be expected to be a leader on the team and continue his production. First baseman Justin Morneau won the MVP award and overall numbers are even more impressive considering he was batting in the .230’s in May. He ended up 34 homers and 130 RBI’s, and was probably a big factor as to how the Twins won the AL Central. He’ll be expected to live up to his 2006 numbers with the upcoming season fast approaching us. He’s yet another guy on this team who has potential superstar written all over him. Right fielder Michael Cuddyer also broke out in 2006 with 24 HR and 109 RBIs. After bouncing around in various positions on the baseball field, he’s found a permanent home in the outfield. Like Mauer and Mornaeu, he’ll be expected to main or exceed his production in 2006. The Twins also brought back one of my favorite players and fan favorite Torii Hunter after the team took on his option for 2007. Although he had a down year offensively, the team needs his outfield presence and defensive wizardry to help out the team. Rondell White was re-signed after a subpar 2006 and will probably man the left field spot or be the designated hitter most of the time, with Jason Kubel perhaps playing in the field. The rest of the infield is pretty much set Jason Bartlett at shortstop, Nick Punto at third, and Luis Castillo at second. Bartlett with limited playing time batted over .300 and was hot for a stretch and the Twins hope can continue has production. Punto has a strong year as well, where batted .290 and should bat at the bottom of the order. Castillo, much like Punto and Bartlett had good year at the plate as he batted .296. Although the infield outside of Morneau doesn’t have much power, they seem to do the little things right, get the key hit and contribute in key situations. They will be expected to continue their role on the team if the Twins are going to be successful. The bench will compromise of infielder former Royal Ken Harvey, Jeff Cirillo, Luis Rodriguez and outfielder Lew Ford & Jason Tyner. All five men will be expected to platoon, especially in the case of Ford and Tyner. 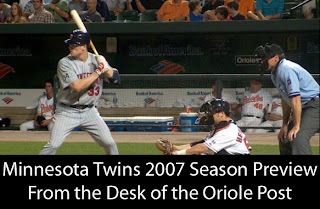 A lot will have to happen in order for the Twins to win the American League Central along with contend with the Detroit Tigers, Chicago White Sox and Cleveland Indians, but won the division unexpectedly in 2006 and with their young talent and pitching. However, 2007 may be a different story with the pitching situation as it is right now and in turn, may play an outcome in what happens. In the end, the Twins have surprised the baseball world before, and there’s not reason to believe it can’t happen again. Barry Gone from the Giants? For the Idiot File: Fed-Ex, now Nationwide? 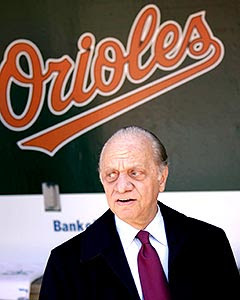 Is Orioles' Owner Peter Angelos Really That Bad? Would You Bet Against This Man?